The 5-tier shelving unit is 72 inch. H x 36 inch. W x 18 inch. D. Use this multi-purpose storage organizer in your home, garage, basement or utility area to keep your space neat and manageable. It is designed to hold most storage tote sizes, providing you with options for every room. Reclaim your garage with the Husky Track Wall Storage System and put your walls to work! The Husky Track Wall Ventilated Steel shelf allows you to take back the floor space in your garage that is lost to free standing shelving units. Husky Track Wall Accessories feature an easy to clean surface, powder coated in a black gloss finish. With the Husky Track Wall Storage system, re-configuring your storage is a breeze, simply lift up and out to remove the shelf from the hook channel and moved to desired location, ensuring that the supports are placed securely inside the hook channel. For more handy storage options, add other Husky Track Wall Storage & Accessories. 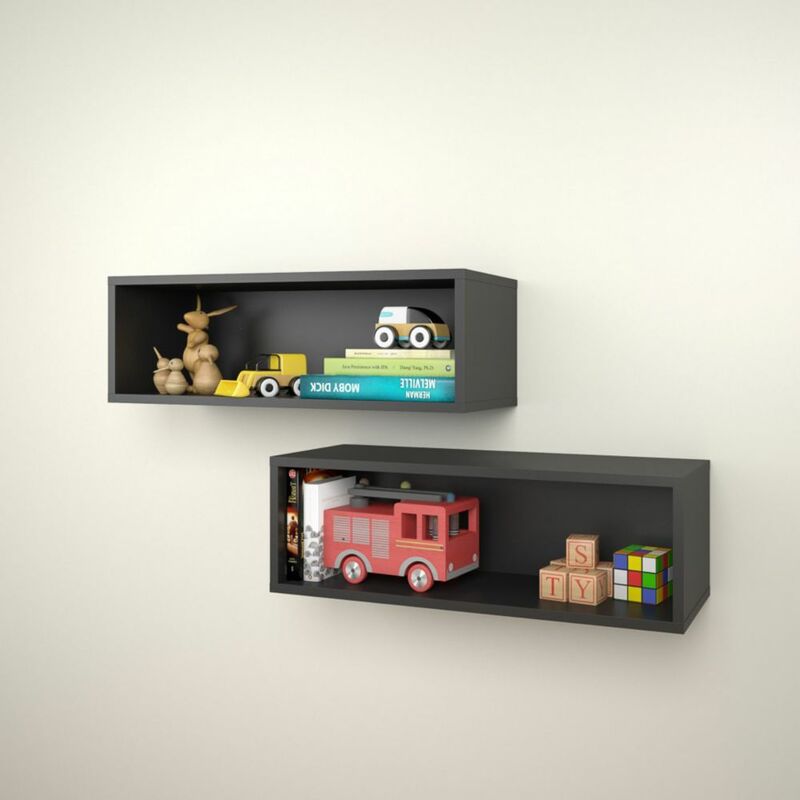 Avenue 27.75-inch x 9.5-inch x 9-inch Rectangular Floating Wall Shelves in Black (2-Pack) Avenue Rectangular Wall shelves will add the final touch to your room setting and complete it with additional decorative storage. Sold in pair (2 units), organize your Avenue wall shelves in any way you like to create your own personalized home decor. Avenue Collection from Nexera offers an urban and modern look for the bedroom and the family room. It can be paired in many different ways with Blvd Collection items to create 2-tone settings (check out Traffic Collection). Avenue 27.75-inch x 9.5-inch x 9-inch Rectangular Floating Wall Shelves in Black (2-Pack) is rated 4.3 out of 5 by 4. Rated 3 out of 5 by Louie from Would have been perfect... Opened up the box to discover there was a chip on one of the boards. During assembly of the second cubby, we accidently chipped it as well as it chipped very easily. Fortunately they are for the camp so we didn't bother returning them. advised Home Depot of the issue and they were more than willing to ”make it better” for us. Hopefully others don't have the same issue. Rated 5 out of 5 by Cynthia from Perfect size, easy to assemble. Delivery was quick. Very easy to assemble. Easy to order. I love how they look on my wall. They are about 2 inches short for most hardcover books but it worked will for my purpose. Rated 4 out of 5 by GeorgeB from Its aiiiiiiiiiiiiiight Pretty decent shelves. Got what I paid for, looks just like the picture! ;). Decent quality for the price, delivery was quick. The wall anchors that came in the box are not the best, but they do the job! Rated 5 out of 5 by Tman from As expected. Pleasantly surprised at how easy it was to install. Different type of wall anchors that I had never seen before, but work great.